More women, more third-tier city lenders, falling returns, and larger, longer loans: a new report sheds light on how the world’s largest peer-to-peer (P2P) lending market is changing fast. After the negative coverage, some of the trends are the opposite of what you might expect: trust is growing and as the sector is seen as safer, its user base is changing. We got some industry insiders to explain the changes. To recap, in China, there are few places to invest money and fewer ways to raise it, with state-owned enterprises sucking up available credit from the mainly state-owned banking sector. This is partly what made P2P lending, where a platform acts as an intermediary to match borrowers and lenders, prove wildly successful in China. However, things were not quite as good as they seemed and high-profile Ponzi schemes and fraud have led to large swathes of new regulations which are expected to see the majority of platforms being shut down. The negative coverage would suggest an industry in decline, but despite the challenges to the platforms, the P2P lending landscape is showing signs of development and maturity as the concept becomes more mainstream. A report released by Dianrongwang (点融网), a P2P lending platform, and Wangdai zhi Jia (网贷之家), online lending consultants, reveals how the lending side of the arrangement is changing: “Breaking with Tradition, Rational Optimism: A Portrait of Online P2P Lending Investors in 2016” (see a summary here). With the collapse of platforms and users losing money, one could expect users to be putting up smaller amounts for shorter periods, albeit with higher returns. 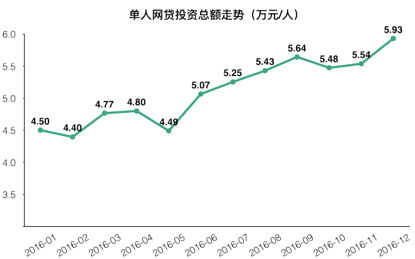 The average investment by individual lenders actually increased 32% over the year, from RMB 45,000 in January 2016 to 59,300 in December. Meanwhile, investment periods are lengthening: from an average of 7.01 months in January 2016 to 9.3 months by December with the number of long-term loans (for a year or more) doubling from 7.99% of investments to 14.06%. Oh, and while returns were falling: from 12.18% in January down to 9.76% by December. People just needed a little time to get used to the concept and the new regulation is good for the industry. “Regulation of the industry is increasing, but this is a good thing, leading to healthy development. The less qualified players will fall by the wayside, but the better-qualified platforms will do well and so in the long term this can only be a good thing,” Ray Zhong, marketing manager for P2P platform Xiaoying Technology, one of China’s top ten platforms, tells us. “We’re also finding that because our products are insured there is greater credibility, meaning people are willing to invest more,” adds Xiaoying’s marketing manager Ray Zhong. Misconception 2: types of people – only for the risk averse? As the dangers of the sector have become apparent, surely only those who like to take a risk and have money to play with would use it. Or the desperate. In terms of different age groups, the youngest group monitored, who are tech-savvy but have no money, grew the fastest. The proportion of investors born in the 1990s reached 16.66% (over 30% on some platforms), up 92% and their investments up 215% though still relatively small, making up 5.25% of the total invested. The proportion of female investors in the top 100 platforms rose from less than 30% in 2015 to over 40% in 2016 – and they invest more than men: their 42.02% of users invested 47.93% of total lending. On some platforms, women make up 30% of users but stump up 60% of the investment. Although one can never assume someone else’s financial situation, the majority of P2P investors wouldn’t appear desperate as ordinary office workers make up the bulk at 72.78% (private enterprise workers at 53.93% and state-owned enterprise employees at 18.85%). There was stronger growth from the less developed parts of the country. Lenders from cities, in general, grew 27% and their investment 156% whereas the group consisting of investors from third tier cities and below, typically poorer areas, grew 47% and their investment 180%. And the cherry on top? 90.32% of investors said they’ll increase their investment, only 9.68% said they’ll lower it. Average total investment amount by individual investors. Unit RMB10,000. Women are wealthier and have been able to suss out what’s safe. “Women’s investments have gone up due to their salaries increasing. They’re now earning as much as men and in some industries even a bit more. With their increased spending power they’re now turning to investment,” says product manager Emma Qin. “There’s another sort of tradition in China where women are seen as more based in the home and looking after kids, and even though both parents now go to work, women are still more in control of how the family money is allotted. As P2P lending is now seen as quite a common way to invest in China, more and more women are using its products,” adds Qin. Those born in the 1990s, millennials if you prefer, are tech savvy but are also being lured into the sector with flexible products – and snacks. “The post-90s group are now as old as 27, have entered society and could have been working for five years by now… In terms of investing, they’re at the beginning of the whole process… They’re starting to invest more, but this growth is somewhat limited. Education is long in China so they will only have been working for a while and they need their money for living on – essential needs,” says Qin, adding that platforms such as their own are trying to attract these young investors now as they’ll be more valuable later in life. Why more third-tier city investors? Low thresholds, lack of alternatives and the relative safety of P2P compared to other investment available in third-tier-and-below cities are having an impact. “In the first and second tier cities, there are more investment opportunities and understanding of investment such as real estate and shares. Typically salaries have been lower in third-tier cities, but have been rising fast and as individuals or families now have more investment aims, even if the money they have available is quite small,” said Qin. Growing trust and the changing user base suggest that P2P lending in China is going to be an industry to watch rather than ignore, even if over 3,000 platforms have already collapsed and a couple thousand more could join them.